Since 2002, Shenyang Seibertron has been a tactical gear superstore supplying outdoorsmen and women with the gear and clothing they need to have successful missions. They’re known for their reasonable prices and high quality. Today, we’re going to review the Seibertron Falcon Tactical backpack, a great choice for overnight camping trips and day hiking. 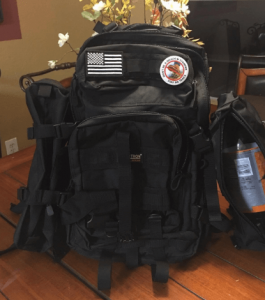 Inspired by the United States Army’s MOLLE equipment, this pack is lightweight, versatile, and has many pockets and compartments for neat organization of your stuff. In this review, we’ll break down some of it’s key aspects and list out the pros and cons so you can figure out if this is the right tactical pack for you. In a hurry? Search for the best price on amazon here. First off, let’s get into the technical specifications of this pack. It comes in two sizes- a 37L and a 27L. The 37L measures: 19″ x 11″ x 11″. The waist belt maxes out at 45in and the sternum strap accommodates up to 60in. The 37L version of this pack also features a velcro American flag patch. On this size pack, you can also there is an option to purchase either one or two detachable side duffle types of bags for added storage. The 27L measures 16.5″ x 9″ x 11″ and the waist belt maxes out at 39in. The sternum strap extends to 51in. The side pockets on this pack can hold two 2L water bottles. The Seibertron tactical backpack is made from 900D material which is waterproof and both sizes come in two colors: Black and Khaki. The the zippered areas on this pack are not waterproof however, they are water resistant. The shoulder straps on this pack are connected by plastic D rings and are 7.2cm wide. The ends of the shoulder straps are not sewn at the ends, meaning if you’re not careful, they can completely remove themselves from the tension lock. On the front and sides of the pack there are adjustable straps to cinch down and secure the load. There is room for a 2.5L water reservoir but the reservoir is not included with the pack. Keep in mind when considering purchasing, only Seibertron’s water reservoirs will fit this pack. Either size of this pack can be used as a carry on bag for air travel. This Seibertron backpack features a MOLLE design, the replacement for the ALICE packs we recently reviewed. MOLLE is the current standard of load bearing equipment utilized by the U.S. Army. One feature of this system is the use of heavy-duty nylon rows stitched into the fabric. This allows for the attachment of pouches and accessories. These rows offer faster access to frequently used items and make the pack highly modifiable, making it a useful pack a for a wide variety of outdoor experiences. This pack breaks down into four major compartments. There’s the main large compartment closest to your back, a medium compartment and two smaller outermost pockets. The main and largest compartment features a mesh pocket and a zippered pocket to keep smaller gear and tools organized. This pocket sits directly against the wearer’s back so depending on what you choose to put in there, it could cause discomfort. Since there is no frame, filling this pocket with something bulky would prevent the pack from lying flat against the wearer’s back. The sides and top of the Seibertron backpack are able to be cinched down with security straps to compress space or keep the load stable. 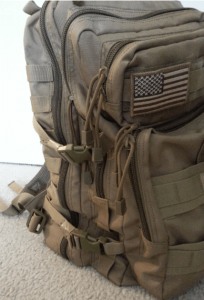 There are also numerous MOLLE loops to attach more gear which are spaced roughly every 1.5in. Next up, we’ll distill some of the information we just covered for a quicker reference guide. Then we’ll get into some frequently asked questions. 900D is density and thickness of the cloth. D is an abbreviation for “denier”. The larger the number, the thicker the fabric which means higher durability and resistance against abrasion. To put it in perspective, ultralight hikers usually have packs with a denier of 70 and ballistic nylon rates somewhere into 1,600D. Where are these packs made? Shenyang Seibertron is a Chinese company but the backpacks ship from the United States. Be wary, Seibertron is only selling these packs through their website and through Amazon, all other retailers are not authorized. Does this pack have a holster for a pistol? No, there is no holster for a pistol on this backpack. Can this pack hold a water bladder? Yes, it can hold a 2.5L water bladder and there is an opening for a quick release drinking tube to be threaded through. However, the bladders are sold separately from the pack and are only compatible with Seibertron hydration water bladders. Seibertron offers customers a discounts of 30% on the hydration packs when a backpack is purchased. Can a laptop fit in this backpack? Yes, on the inside of this pack there is a sleeve for a laptop or a tablet. This medium sized pack has so much to offer whether you’re looking to get outside or need a lot of flexibility in terms of day to day travel from home, school, and work. The Seibertron Falcon Tactical Backpack is made from a thick, durable fabric and features strong zippers with paracord pulls and tightly woven MOLLE style webbing. One thing’s for sure, this backpack won’t wear out on you anytime soon! Plus the variety of compartments, pocket sizes, and compression straps will help keep your gear organized and secure. Don’t delay getting this great pack! 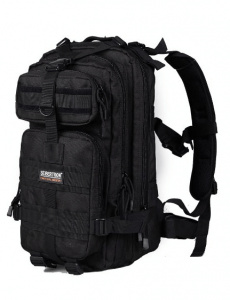 Shop the Seibertron’s Falcon tactical backpack on Amazon here.